St. John’s Lutheran Church sanctuary, built in 1954, is typical of mid-20th century colonial revival tastes. 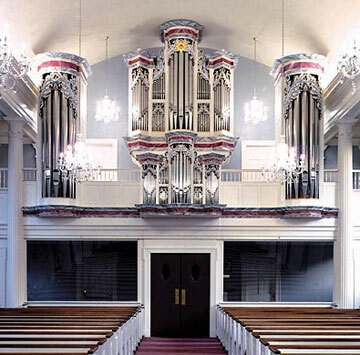 In 1991 discussions began to replace the original Schantz organ which was installed in chambers at the front of the nave, with an antiphonal division in the back gallery. Director of Music, Steven Rapp, was hired initially as advisor for the organ project and later assumed the fulltime duties of organist and choirmaster. The contract was signed in 1993 and the organ installed only two years later, in 1995. This three manual organ is based on the precedent of Basedow, Germany by the organbuilder Gercke. It takes advantage not only of independent pedal towers, but also puts the Hinterwerk case literally behind the Werk in the bell tower. The seemingly small Ruckpositive case actually contains 9 stops including a Dulcian 16 foot with short length bass resonators. The elaborate decorative scheme consists of polychrome faux marble, oil gilding, and pipe shades by French carver Daniel Spiesser. The organ continues to be the backbone of an ambitious music program.